J-Hoppers Hiroshima Guesthouse i Hiroshima, Japan: Bestill nå! We try to be up to date on what is happening in the area and can give you advice where to go. We are a meeting point for travelers from all over the world! *The room looks like a capsule hotel. Each bed space is divided by walls individually to maintain privacy. Each bed space is quite large with a personal bed light, plug outlet and boxed table, which can be locked with a padlock for your valuables. *Private rooms are Japanese style with traditional tatami mats. 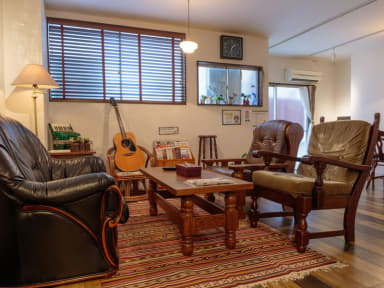 Every room is air-conditioned and puffy Japanese style futon sets are installed. We have some twin rooms, double rooms and one triple room. A shower room and a toilet are not in a guest room. Toilet rooms and shower rooms are on every floor can be used for 24 hours. 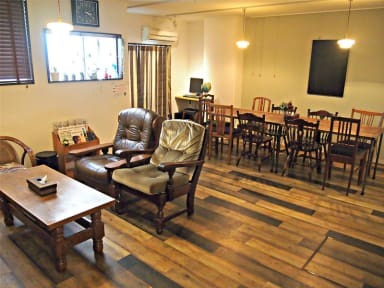 We have a communal Kitchen which is fitted with a microwave, toaster, coffee maker, rice cooker, cooking utensils, table ware etc..
-TV lounge -TV with international programs (CNN.BBC etc) and some games. -We are very sorry but we don't have an elevator. good hostel and freindly staff. location on lonelyplanet is wrong, but after i called the reseption i figured out. Nice people and good safety with doorcode and good place with lock for luggage. they allowed me to take a shower even after check out which was super helpful. not many people there tho, but very nice.